What Does a Luxury Home Cost in Every State? Good news if you've ever dreamed of buying a luxury home in North Dakota: you're one of like seven people on Earth. At least you won't have a ton of competition. 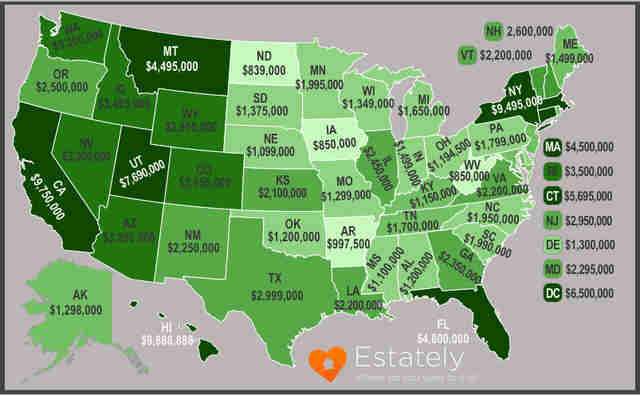 But real estate website Estately recently created a map that shows the minimum amount you need to buy a home fit for the 1% in every state -- including North Dakota! If scoring your own enviable property is your life-long dream, well then, let this map help you set your financial goals. To come up with the numbers, Estately looked at the houses, townhouses, and condos for sale in each state that were in the "1% threshold." The resulting map lists the minimum it would cost you to buy such a home in each state. The results showed North Dakota, of course, as the cheapest state for 1% luxury, at $839,000, while Hawaii came in as the priciest, at $9,888,888. Pretty weird number with all those eights, but, also incredibly expensive. For the record, California wasn't too far behind. What's a hundred grand when you're spending close to $10 million? Yeah, now's the time to stop that California dreaming. Kara King is a News Writer at Thrillist and is happy with her 99% apartment. Send news tips to news@thrillist.com and follow her at @karatillie.